David West Beale is a fishing artist that paints with his words. He has the ability to create pictures filled with feeling from a fishers perspective. The stories he builds are descriptions of his interests in tenkara and fly fishing. They evoke memories that I have had, complex memories of a fisherman that bring those skills to life even with the layman. The knack he has with his writing reaches deep, not just your everyday description of fishing, although he writes of that but things that we may not pay attention to, he writes about things that create moments of importance from things overlooked. Without going on about his work, I hope we are able to share the magic of those moments here. Adam: Thank you so much for accepting my invitation. David West Beale: Hello Adam. I want to say thank you for inviting me. I’m truly humbled and delighted to be asked to speak in such good company. I’ve been aware of Tenkara Fisher for quite a while and have enjoyed quietly dipping in and out of site. What strikes me is the generosity of spirit found in the pages here - both from your contributors and from your good self in gathering and curating what has become a wonderful resource. So thank you for including me, it really is my pleasure. I would also like, if I may, to ask a question of you. Through your journey along the path of tenkara you have gathered much knowledge from classic sources in Japan. Adam: Emotional experience… Let me think about that. I’m from Phoenix, Arizona, 5th largest city in America, busy, dusty, spread out, 100 miles across city and my city borders the Sonoran Desert. I go outside and the mountains are rock, brown, black, cactus and trees with tiny leaves. The flora and fauna of the desert is the exact opposite of the pine forest of my home streams. It’s a contrast to the desert, fishing those streams, dreaming of new experiences, planning, executing the plan, doing it again. I go from a super big ugly city to quiet beautiful mountain streams filled with clean air and beautiful wildlife traveling through everything between. I explore the mountain states around Arizona and share the enthusiasm for tenkara with a global community. My friends in South Africa, Russia, Canada, Europe and where tenkara developed in Japan and I travel there. I travel to Hawaii and catch fish there in Waimea canyon, tenkara is mountain stream fishing and there are mountain streams in Baja, Mexico. Sky islands surrounded by gnarly deserts. My fishing is a dream compared to where I live. Emotions come from changing the scenery, meeting distant friends, realizing my dreams. David West Beale: I’m not sure that I do - you should see what goes in the trash!.. but it’s very kind of you say so. I do write a little about tackle and techniques but above all I’m a story teller, and my stories are from the heart and as honest as I can make them. I think that’s what my readers at tenkara tales respond to. This endeavour we call fishing is fertile ground for the story teller, and while we are all individuals, as anglers we share a common experience too. This is what I am trying to convey. Not the biggest fish or the most fish (although a few monsters do swim through the pages), but the magic that is waiting there for all of us if we have an open heart and eyes to see. I try to bring the experience of being there to the page. Little cues can bring a scene to life with a resonance that feels familiar to the reader. Sounds, smells, textures, colours, changing atmospherics, all of these things are a part of how we experience the external environment. So I try to bring my own experience of these things into my writing. Psychologically, our ambitions and insecurities, our successes and our failures all play out on stream, so really the stories in this way write themselves. Adam: I’m not classically read regarding fly fishing. My research into tenkara is historical. My interest in fishing is research and review of the experts and their techniques both fly fishing and tenkara. There are quite a few classic books on fly fishing yet I choose books by Gary Borger and his nymphing, Gary LaFontaine and his entomology. John Gierach and his stories, I’ve read a few but I prefer his story lessons on small stream fly fishing. Soseki Yamamoto, a Japanese Keiryu writer and author of many fine books on our subject has written stories about fishing as well as books on technique. I’ve had a couple of books translated that were more about the people, equipment and techniques that were not well received. Sure, there were a few people that enjoyed them but for the most part, there are not that many people that study deeply into the rich history of tenkara and the tenkara secrets found within these books. Here in the English reading world, we are thin on books about tenkara. There are a few and in those books are vignettes, short stories about tenkara but this type of story lesson writing is practically non existent. For me, it is enjoyable to read your stories. You do both western fly and tenkara which I find desirable. David West Beale: The one is seasoning of the other. When I discovered tenkara I learned that now I could do all of the things I’d wanted to do with western fly fishing but couldn’t, at least not as easily or effectively. I’m talking about ultra-finesse presentations and fly manipulations. These things unlocked for me the secrets of the river which until that moment had remained hidden and unknown. But it isn't just the tenkara method of fly delivery that has opened up my fishing, just as important is the Japanese philosophy of kebari design. Form defined by function. An escape from Victorian entomology-based fly design, codified into the ‘matching the hatch’ approach. I believe that we seldom if ever really match the hatch. Those types of flies are an aesthetic conceit of the fly tier. Don't get me wrong, I love the craft involved, but I’m something of a heretic because I believe most if not all takes are induced. Dr Ishigaki’s work on the limits of trout vision gave me 20/20. A revelation. So more than anything, kebari design has been the biggest influence that’s crossed over into my western fly fishing. That and the understanding of previously overlooked places - tiny places - where it turns out that fish can be. It’s been said before and it’s true - tenkara makes you a better western fly fisher. On the reverse of the coin, tenkara has made me appreciate the joy of fly line casting and the simple pleasure of feeling a rod load and laying out long tight loops with a western fly rod. The biggest contrast is the way I now have to revise down my catch expectations for those I times when I’m not with my tenkara rod and kebari. But I believe in matching the right tool to the right job. I love all forms of fly fishing, so if for example I’m chasing pike then it’s an eight or nine weight western fly rod with big streamers. I must admit I’m a sucker too for good design and engineering, so I love a nicely machined reel and a finely made rod. These things bring me pleasure whether I’m catching or not. 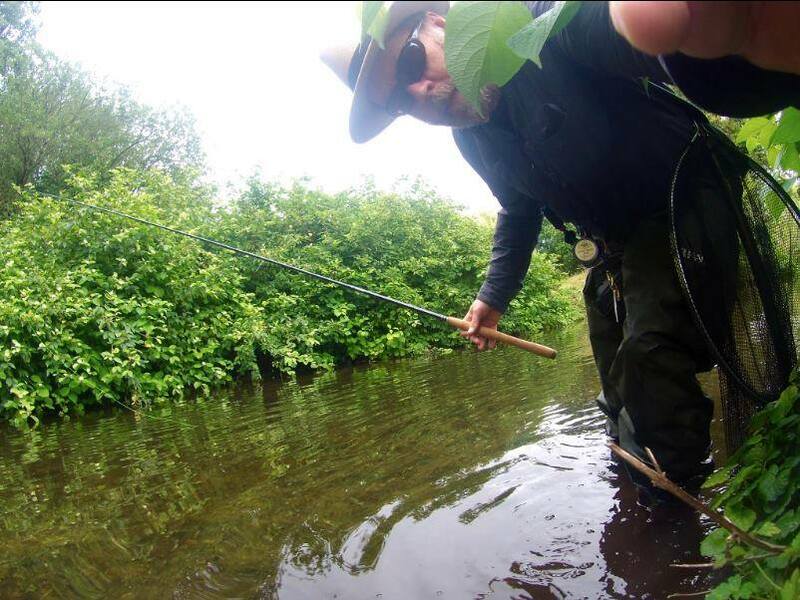 Adam: My fly fishing small streams before tenkara consisted of long rods and lite lines. When I found tenkara, the rods got longer and the lines lighter, steps I enjoyed in a direction that I liked. I initially learned Japanese tenkara from Kazuya Shimoda. He promoted a method that the simple fly fishing of Yvon Chouinard follows now. History is not always kind, “Simple Fly Fishing” will be attributed to Yvon and Patagonia but the fact of the matter is, Shimoda-san was doing this type of tenkara long ago. 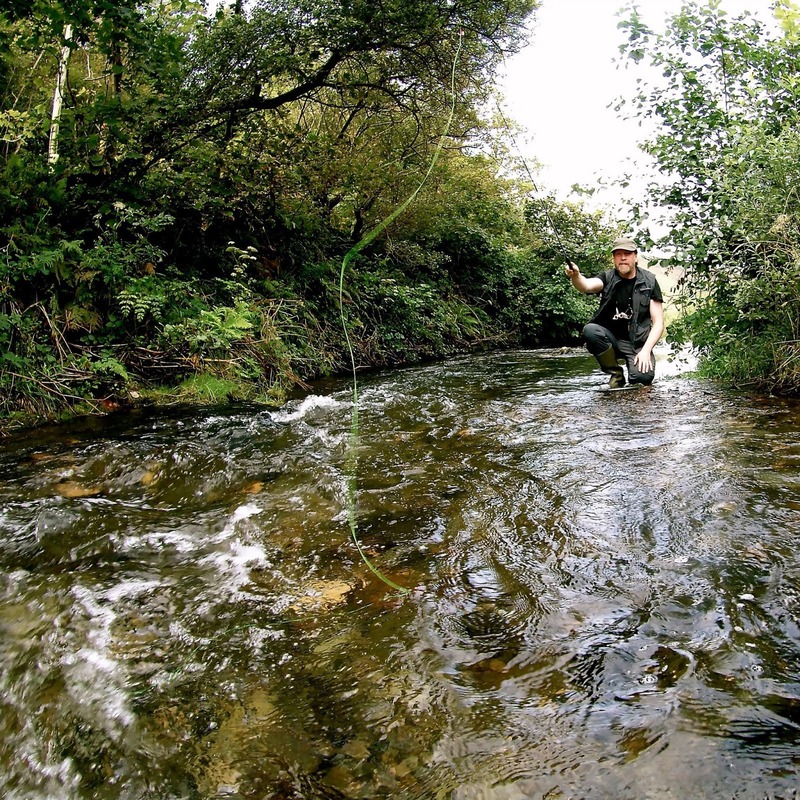 For the most part, people do not know about the history of fly fishing in Japan. “Headwaters” magazine (Japanese) detailed the timeline by its content through the years starting in the mid 90’s. Sort of interesting, this type of tenkara is how I learned but many tenkara purist Americans would not call this tenkara! I’ve always said since day one, “tenkara is easy to learn, hard to master” and the more I learn, I realize that there is still so much to learn from the Japanese. As I gained a little knowledge, before I knew about the different schools in Japan, I thought the level line school of Hisao Ishigaki was it. That everything else just didn’t reach the level that Ishigaki sensei had developed. I was so naïve to think I had it figured out but I should have known, I knew just enough to be dangerous. I think that is where we are at now in the general tenkara community outside of Japan, naïve. Arguments within our ranks of what is and what isn’t tenkara. 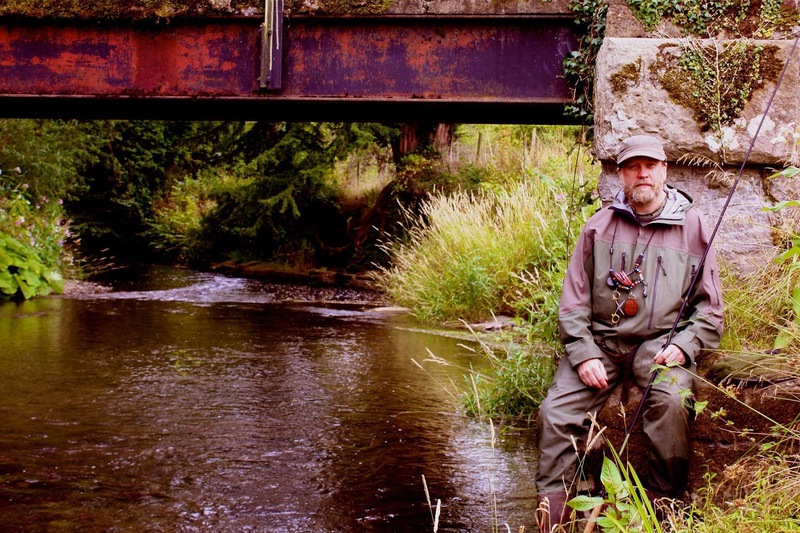 David West Beale: Discover Tenkara has undoubtedly brought a great deal of quality content out into the light of day here in the West. I love John and Paul’s passion for tenkara. Most interesting to me is Paul’s insight into fish behaviour and fly design from his perspective as a freshwater biologist. I do have some of the Discover Tenkara instructional material but I tend to stay away. That’s more a reflection on me than on Discover Tenkara. As my friends will attest, I’m something of a contrarian and like to figure things out for myself on stream. For me this sharpens the instinct and sweetens the taste of success. It is fun though to dip into their instructive texts once in a while and find out that the little wrinkle I just figured actually has a name! Adam: I have not read the complete works of the Discover Tenkara guys. They enlist the help of the Japanese experts and I appreciate that. Daniel at Tenkara USA has exposed a couple of different schools, the level line of Hisao Ishigaki and Eiji Yamakawa that represents Harima Tenkara Club and the school of Hiromichi Fuji with his tapered multi strand lines. But both teachers (Tenkara USA and Discover Tenkara) outside of Japan have largely missed out on the excellent work of Shimoda-san. I don’t think anyone did anything wrong, I’m not pointing fingers, nothing like that. I just think the field of view in tenkara that the community places on it isn’t so small, it’s much more broad in scope. Patagonia and Yvon Chouinard are actually doing a good job with their methods. Although that is not my school, it is tenkara and Patagonia is very popular in Japan. I believe as more and more people research the history of tenkara inside of Japan, we will find that tenkara, as small as it is, there is a much broader scope of practice. David West Beale: It matters if it matters. We all have different perspectives. For the practioners of those schools and those who study and celebrate them, I have the utmost respect. It is vitally important to celebrate the pure essence of our sport and keep its flame burning bright. At the same time, any cultural export is liable to local interpretation, evolution, dilution even. This will sound contradictory, but at this time I follow no school of tenkara but I’m so happy that others do. I’m completely in a bubble of my own making, but the bubble is permeable. Adam: Fly fishing has roots in your area. I’m afraid I have only scratched the surface in researching its history. I’m a little embarrassed about it but I understand enough about it to be able to hang in there a little. My research is into the history of the fly fishing rod! I’ve had the wonderful opportunity to handle some of the oldest fly rods made. Beautiful, gorgeous wood and bamboo fly rods from your area. David West Beale: I’m no great collector but I do have a few cane fly rods, and I love fishing with them. They feel alive in a way that only an organic, artisan-made rod can. I have one old cane rod that I fly fish for pike with - there is something wonderfully earthy and gothic about that. When it comes to fly rods my taste is for a slow action, and cane, I think, does this best of all. I am interested in the angling heritage of the British Isles, more so in fact as the years advance, and some of the foremost works on fly fishing originated here. In the 1600’s, in The Compleat Angler, Charles Cotton describes casting simple hackle wet flies to trout in upland streams, using long fine lines fixed to long flexible fishing rods. Sound familiar? Earlier still, in 1496 a Treatyse of Fysshynge wyth an Angle was published containing fly recipes and advice on how to fish them using fixed line fly rods. I’m sure that if we could build a time machine and go back to visit these anglers, our tenkara gear wouldn't seem that unfamiliar to them. So for me, tenkara, as well as providing a wonderful window into a sublime Japanese fishing method, has also given me a means to explore the near lost tradition of fixed line fly fishing here in my homeland. Perhaps that’s why it felt, the first time that I fished with a tenkara rod, that I had reconnected with an old friend. Such resonance is important, I think, to our wellbeing, whether we know it or not. I’m very fortunate to live close by to some of the rivers talked about in the works just mentioned. So for me, when I take my tenkara rod and fish the river this way, the river that Charles Cotton fished, the river is made of time and we are connected. Tenkara gives me chance, in modern terms, to fish as my forbears did and share something of their excitement and the challenges they conquered. Adam: I’ve read about English chalk streams and gillies that take care of their beat. In your area, this is where fly fishing has really developed and moved outward from there. I don't know about other countries outside of Japan, but I will say that in comparison to the U.S, tenkara here in the British Isles is very much a fringe pursuit. To put this in perspective, we have a population of around 66 million and angling fraternity of around 3 million. The last time I looked on the British Tenkara FB page there were just 286 members and many of those are from overseas! Similarly the UK Tenkara Forum has an online membership of just 180. So I believe it’s fair to say the British tenkara angler is a rare animal indeed, even possibly an endangered species. Those putting themselves at the centre of our small stage could do more to remove the perceived barriers to participation in tenkara. I hope that, in small ways at least, my writings help, and I’m always delighted when a reader asks me for advice on getting started with tenkara. I have no skin in the game, no vested interest other than my hope that if I inspire others to enjoy and love their rivers as I do, then nature has more people on her side, and that those people will be happier anglers for it. As to how tenkara is received by the wider angling community here, this is a double-edged sword. On the one hand I don't think we are a big enough blip on anyone’s radar for any prejudices against tenkara to have really taken hold. On the other hand, If you are a gregarious tenkara angler then it is a lonely existence. As to how my own tenkara has been received by other anglers, well it’s varied from being politely humoured, to being the subject of mild curiosity and even to outright ridicule. That is until I start to out-catch the doubters! However, personally I’ve never been received by any river keeper or other controlling authority with anything other than the warmest of welcomes and in many instances I have been positively encouraged to bring my tenkara along. So I’m saying that the low uptake of our sport in Britain has little to do with any lack of good rivers to fish, in fact we have an abundance. Adam: It’s interesting, I have a friend that was fly fishing before we knew each other. I taught him tenkara and he really likes it. He reads social media and sees what I share with the community, he is acutely aware of my participation but he does not participate. But he does talk to me about it. It’s funny, he teases me about the whole thing. David West Beale: I fish a lot on my own but I have regular fishing buddies too. Yes, they read my work, some more than others..and yes like you I sometimes come in for a bit of good natured ribbing.. I can get my own back by writing about them though! I have also made one or two good friends amongst my readers, and we sometimes meet up and fish. Adam: Over the years of fishing, writing, traveling and sharing common interests, I’ve found myself wondering, “Where am I going with this?” Even as I write the content for my book on tenkara, I still find myself wondering, “Why?” I read very few English language books or magazines any on headwater fishing. I think the renaissance period of small stream fly fishing is over. Yet tenkara is filling the void and it adds in a new dimension of badassery. Is that even a word? (laughing) The kind of climbing and fishing that Sebata-san, Kazuya-san, Okushi-san and many more people that I have not mentioned from history and the groups of people doing it now. That’s the draw for me, there is a steady stream of this in social media. Those people, their groups, they want to share what they are doing yet the type of terrain they have is unique to their area. On my last trip to Japan, I was taken on a pretty mellow adventure and there were a couple of times where I was thirty feet up on a vertical wall of dirt and mud held together by grass roots, shrubs and trees. On a thin path, starting to slip and everyone had to go up and up forever, might as well been forever and we all had heavy packs on… drenched. It was intense. If I lived there, I would be in the thick of it with them pushing it but I was a visitor and nearly over my head on a pretty easy fishing adventure miles up a wild Japanese stream valley, all in possible self rescue mode if someone fell. Only canyoneering in America approaches it and in all of my research into that here, I haven’t read any canyoneering people doing it to go fishing. You have to go to Japan to understand that grade of adventure fishing. David West Beale: Yes and no, but there again my reality is just that - my reality, not someone elses. I have no experience of genryu fishing so I have to use my imagination here and a little experience I have from younger days when I climbed mountains in Cumbria and Scotland. So, I think back to those times and think too about the adventures in Japan of Yuzo Sebata and others that I have read about, and what I imagine is this: the visceral experience and excitement of overcoming physical and psychological challenges to access new and remote places to fish must in some way heighten the experience of fishing and imbue those moments with a different meaning. Would I be doing the extreme stuff if I were younger and physically there? Yes I would if I could. But do these things make you a better tenkara fisher? Well ‘better’ is a subjective, relative and qualitative description. So I’ll limit my answer purely to the technical aspect of fishing tenkara and on this level - yes and no. Yes, in the sense that, if through genryu fishing you encounter unfamiliar fishing scenarios and/or different types of fish than are available to you lower downstream, then this new challenge will undoubtedly expand your technical repertoire, should you be open to that. But qualifying that with a ‘No’, in that all rivers are different and the requisite skills that could be gained through genryu can doubtless be gained on some rivers in some places at lower elevation. But I see the attraction of genyru and I’m open to that seduction. Isn't it a natural impulse in the angler to be drawn ever upstream in search of enlightenment? It’s certainly something that’s been calling to me with a louder voice of late, and I have plans of my own here at home to address that. Adam: I don’t think so. I do think that with anything we do, there are going to be people that push the limits of adventure. In mountain stream fishing, I think the Japanese are leaders by far. I think the guys I have mentioned, their friends and peers are the stand outs. David West Beale: For a variety of reasons time has been quite limited over the last year, but on the other hand I like best to fish tenkara on rocky, high energy rivers and streams. Living in a lowland area this means I have to drive to a different type of geology. So a typical jaunt for me is mostly there-and-back-in-a-day road trips - up at 4.30am, drive three hours, to say for example the Peak District National Park, on the water by 9am and fish through to 5pm with hardly a break. Then back in the 4x4 and home by 8pm. It’s quite a gruelling schedule, especially as I’m usually so excited the night before that I stay up late and don't sleep! But hopefully in the middle of all this will be some time wild brown trout, sometimes some rainbow trout (yes we do a have a few wild ‘bows over here) and maybe a few grayling. On the way home I’m already planning the next trip. Adam: I’m in my late 50’s, a little overweight but still hike and enjoy a several mile jaunt up a steep mountain stream. I figure I have a few seasons left where I can feel comfortable in pushing it a little. I’m taking it a season at a time trying to write checks with my head that my legs can cash. I do a little pack rafting on rivers with some fly fishing thrown in. I have plans to visit a friend in New Mexico to do some bike packing to tenkara in the mountains. David West Beale: I like the sound of all of that. I will be pushing my limits the next couple of years too, searching out mountain trout so I’m starting training for that. It will be hiking and scrambling and climbing and camping wild, with just bare essentials and of course a tenkara rod and a few kebari. So yes, genryu fishing in an English kind of way..
Adam: I’ve done quite a bit of fly fishing in streams, rivers, lakes and in the ocean. David West Beale: The short answer is no, I’ve never cast a fly into the salt. Which is strange for an island dweller who fly fishes. I can’t explain for sure why that is but it is definitely something I will get around to. Rivers though, wild rivers, that’s my passion and time is so limited that other types of fishing get pushed aside I guess. Adam: My work is in cardiology, I do all kinds of testing on the heart for a group of cardiologists. David West Beale: Well in comparison to that, maybe something less meaningful, but I design and build gardens for private clients - big, beautiful English country gardens. It’s something I’ve been involved with for almost twenty years, and last year I launched my new design business which is going really well. But it’s like an infant that needs constant feeding, so I’m still trying to get the work/life balance right. Adam: David, I really appreciate what you do, your writing. David West Beale: Thank you, that’s very kind. I plan to take my tenkara to ever more remote and wilder places in the British isles, and rest assured I will be blogging about that! 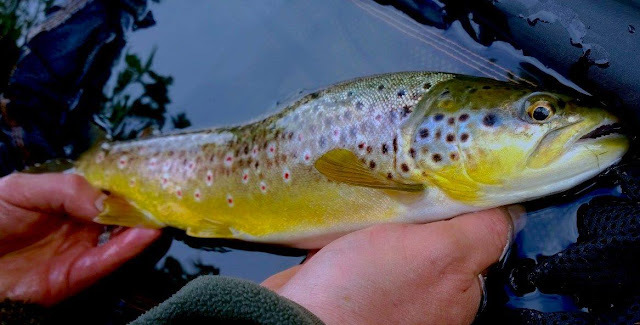 One project I have in mind is the pursuit of the highest altitude wild brown trout that I can find in England, possibly land-locked Arctic char too. They were stranded in some of the hill corries (mountain lakes) here after the last ice age retreated. That would be a tough gig but pretty cool with tenkara. I also have a couple of ideas for novels based around fly fishing if I can ever decide whether it’s two stories or three I have rattling around in my head. Adam: Thank you so much for your participation. I appreciate who you are and what you do. David West Beale: Well yes - thank you for having me over, Adam, it's been fun. Looking forward to your future posts here. Learning that you too may have a book in the pipeline, I’d like to wish you every success with your project and look forward to the fruits of your endeavour. Respect. 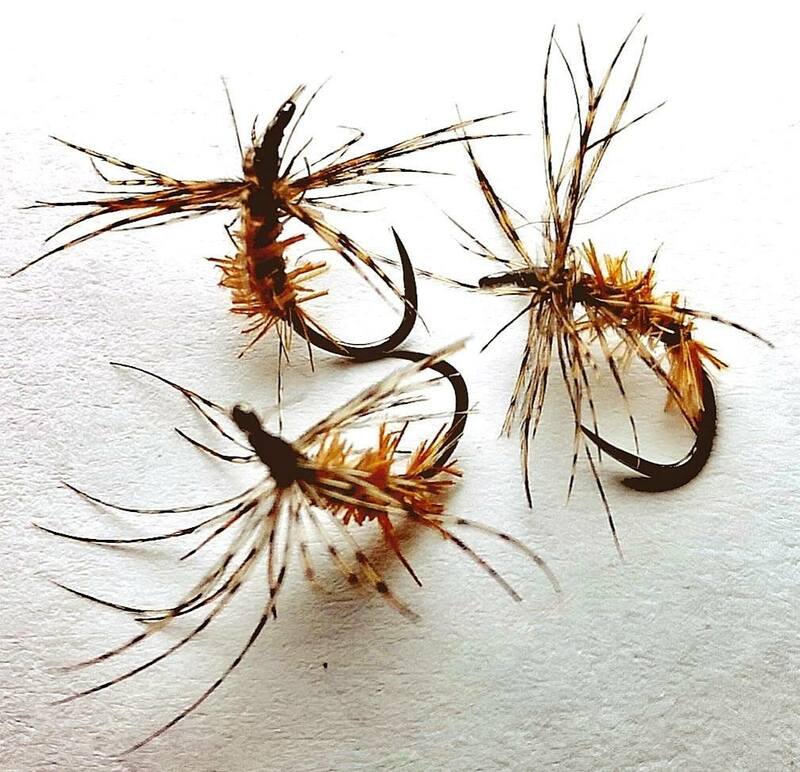 David West Beale web site, "Tenkara Tales"